This article proposes a possible origin for this thinking, and discusses the validity of the underlying model. Above is a model (Lewallyn 1995) proposes for a Guanella 1:1 balun using a coil of coaxial line to wind the choke, and goes on to give some equations for analysis of the balun in the context of the following model. Above is a figure from Lewallyn that captures a very simple linear circuit model that is often used in thinking about a balun in an antenna system. Insertion VSWR will be no worse than about 1.1. That sounds like a good objective, designing for Insertion VSWR in a matched system. Note, that says nothing about its behaviour for other than the case Z1=Z2=50/2Ω (with the centre grounded), nor for the effectiveness in reducing common mode current (its principal function). A problem in applying the model to an antenna system is that the model assumes all interconnections are electrically short (ie no significant transmission line effects) and the two GND points are the same point (ie that there is not potential difference between them due to the current that flows between them. A very important point is that the two places labeled “GND” are THE SAME POINT. 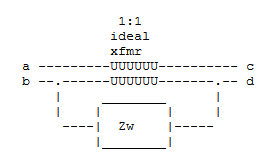 If Z1 and Z2 represent an antenna or antenna/feedline, the path back to the balun input must be included in values Z1 and Z2. Or, to put it another way, Z1 is the impedance measured between terminals c and b, and Z2 the impedance between d and b, with the balun disconnected. The above conditions are unlikely to apply in a practical antenna system, so models based on them are unlikely to be valid, and conclusions based on those models are unlikely to be valid. A further problem is that real antenna systems are unlikely to be accurately represented by Z1=Z2=50/2Ω. 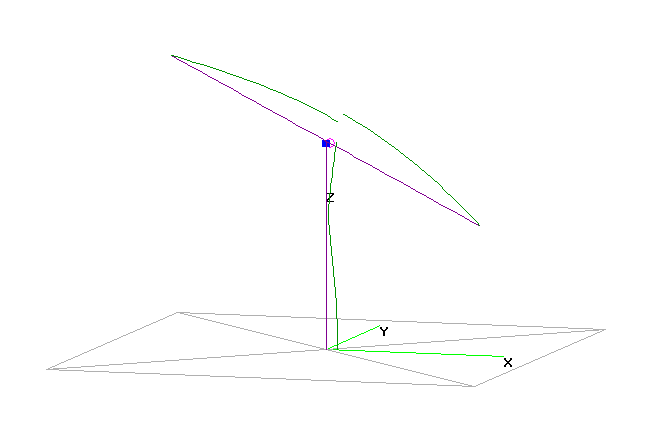 Above is the model geometry of a sloping dipole in NEC. The vertical conductor models the common mode current path of a coaxial feed, the blue square near the top is a balun modelled as a load of 5+j500Ω. The red circle is the source exciting the model. 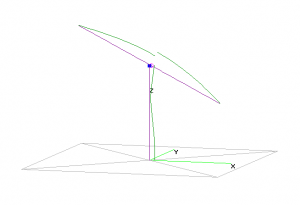 This is a classic way of modelling a coax fed dipole. The model solution shows the magnitude of current on conductors. The figure shows there is substantial common mode current on the feed line, the “Rule 500” balun was not effective in substantially reducing common mode current. Duffy, O. 2010. Baluns in antenna systems. VK1OD.net. Lewallyn, R. Nov 1995. The 1:1 Current Balun: http://eznec.com/misc/ibalun.txt (accessed 14/05/14). Reisert, J. Sep 1978. Simple and efficient broadband balun. Ham Radio Magazine Sep 1978 p12.